When loner Faith Flores finds her mother dead of an apparent overdose, she refuses to believe that's the case. Sure, her mom made some bad decisions, but leaving her daughter would never be one of them. Unfortunately, the cops are all too eager to close the case and move on, sending a distraught and unsatisfied Faith to live with her Aunt T in the suburbs of Philadelphia. But a note from Melinda, her mom's junkie friend, prompts Faith to begin digging, igniting her passion in science and her need for answers. Faith soon discovers Melinda and her mother had participated in an experimental clinical trial to treat heroin addiction. Then Melinda also turns up dead from an apparent overdose. Now Faith is pulling out all the stops in her search for truth, cutting school, lying to her aunt, her best friend, even the police. The only person she can't lie to is new boy Jesse, whose brutal honesty is a welcome respite from the mountain of misinformation uncovered by her investigation. Faith's investigation takes her through the myriad back alleys and laboratories of Philly, all the way to one of the most powerful scientists in town. But when the medical examiner's body is found in the Schuylkill River, Faith realizes if she doesn't find who's behind the sinister science and its cover-up, she could be next. Janie Chodosh is a scientist wannabe and a naturalist. Janie has spent the last decade teaching high school English and middle school science. When not writing or obsessing about writing, Janie can be found with her family in various outdoor pursuits including bird watching, rock climbing, or trying to grow a garden in the arid southwest. She lives in Santa Fe, New Mexico, with her daughter, stepson, and husband. 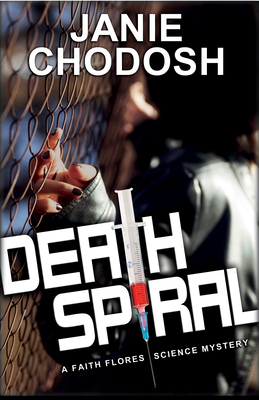 "Death Spiral" is her first novel.